Having privacy and a place to call home is Elaine’s dream.She feels she is getting closer to that dream since she moved into her refurbished studio flat in Brixton in September 2015. “It’s ok, I like it, it’s helping me to become more independent and I’ll be here for about 18 months. I’ve got no complaints, ” says Elaine, casting her eyes around the cosy, fresh environs of her new home. 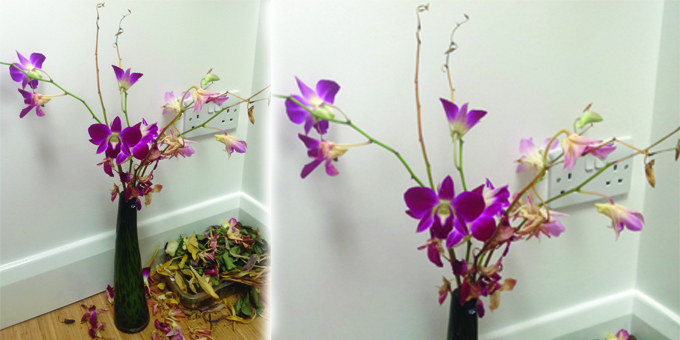 In a corner of the flat stands a delicate orchid in a vase that’s been shedding its leaves, “take a picture of that, says Elaine, when I ask how I might capture her living space … ” it’s about life and death, that’s it, living and dying”. It feels like an appropriate symbol in a milestone journey towards independence that has seen Elaine, 53 , move from a care home for the elderly and a residential home for those needing support with alcohol problems. Over the years she has suffered serious physical health conditions and lost her home in Waterloo after she was made the subject of a Court of Protection Order in relation to her property and affairs (appointeeship). Her tenancy was terminated by the court and Elaine moved to the residential home that she shared with four other women in 2011. Elaine, who has been diagnosed with schizophrenia says the problems started as she faced being homeless. “It was hard to let property and I was threatened with eviction. ” She often found herself seeking support from Waterloo Action Centre, who were “helpful and got a law centre to help”. Elaine’s is a complex story and she doesn’t want to dwell on what she calls “the sorrows”; in a more traditional way of working it would be likely that she would remain in a residential setting. But her chance to move on has been made possible as part of an innovative Lambeth Living Well Collaborative (the Collaborative) initiative. This is helping people with long-term mental health issues to live more independently in the community. The Integrated Personalised Support Alliance (IPSA) brings together voluntary organisations Thames Reach and Certitude, South London and Maudsley NHS Foundation Trust (SLaM) Lambeth Clinical Commissioning Group (CCG) and Lambeth Council. IPSA also functions as an alliance agreement between the five organisations, a relatively new approach to contract commissioning in the health and care sector. In addition to meeting these outcomes for improved quality of life for people, IPSA also aims to deliver 23 per cent savings (around £2.8) against the current budget of just over £12m, by the end of year 2. In practice that means a dedicated multi-disciplinary team, that puts the individual and their assets at its heart. And the new way of working has come with both challenges and rewards. For Elaine’s social worker Mohammed Faruque, who has been working with her for about two years and knows her vulnerabilities, one of the biggest challenges has been to overcome the concerns from the clinical colleagues who were “warning me about the risks Elaine posed in the past with regards to her alcohol consumption and relapse” . “The way I work with Elaine now differs in many ways to how I used to work in the community mental health team setting,” adds Mohammed, who is part of the Alliance Rehabilitation Team (ART). The IPSA principles give more autonomy and a personalised approach, he says, while change is also reflected in recent practice governed by the Care Act 2014, instead of the previous Community Care Act 1990. “In this role my main objective is to facilitate my clients to come out of the stigma of residential care to more independent living with a personalised and holistic approach of care. These sentiments are echoed by Lauralee Price, ART Support Worker, whose role it is to link into residential services to help people step down to semi-independence. “We have got quite a long way in a short space of time,” says Lauralee, who is seconded to IPSA from Thames Reach, where she has been a support worker for nine years (working with those who are homeless, have mental health and drugs and alcohol issues). This includes supporting her in the community and to get through a TRaVEL (Thames Reach Volunteering and Employment for Life) course, based at the Employment Academy in Camberwell. Probably the biggest challenge is the finances and Laurelee helped to access some grant money to get Elaine a computer. Elaine continues with her appointeeship through Lambeth council’s client affairs team. “I cash in £70 a week,” she says. While this covers laundry and shopping, she says she doesn’t have the money to go out… and is negotiating for an increase. “I am outgoing and like to enjoy myself, I like going to the South Bank and would like to be able to go to the theatre and to the gym. It felt strange at first to go out again… it still feels strange because I was isolated. I go to visit my mum every fortnight in Southall and enjoy my visits. I say hello and have a quick chat to the people who live here. The day to day running of the nine, fully-furnished, self- contained studio flats (owned by Certitude) and wellbeing of clients is overseen by Natasa Kyvetou Interim IPSA Cluster Manager – Healthy Living Team Leader. Natasa explains that people are coming from places or wards where they have had more support and less flexibility. “The support offered is flexible and will be adjusted to each person’s needs as well as the area and skills they will need support on so they can improve their independence and day to day living,” she says. Elaine appreciates that, for now, there is someone to keep an eye on her safety. The BRiL (Brokerage & Resettlement in Lambeth) project – 20 studio and one-bed flats, which have been bought on the open market by Thames Reach. Tenants will be given choice on where they live in the borough, maximising on access and support to community networks, meaningful activities and volunteering and job opportunities. The Turrets – a supported living scheme for seven people, with intensive input (rehabilitation model) from support staff available 24 hours and clinicians on site. I’d always want to be updated on new articles on this site, saved them to my favorites! It’s the small, simple things that make us okay. A great informative article. These services are invaluable and I commend you.